My village has officially become a tourist destination. When I saw the first tour bus parked on Main Street a few weeks ago, my first thought was, huh? The walking tour with a microphone-wielding guide kind of threw me yesterday. Maybe it was the tourist carrying a chihuahua in his backpack (so not Tarrytown.) Then I realized it was inevitable. The first step was when North Tarrytown changed its name to Sleepy Hollow a few years ago. In fairness, the area really was known as Sleepy Hollow long before the time that Washington Irving wrote about Ichabod Crane and the Headless Horseman. But for some reason that village was incorporated as North Tarrytown. It’s also not apparent to me why there ever were two villages (Tarrytown and North Tarrytown), but that has been the case for many years. They have separate police and fire departments and each has its own mayor, village trustees and judges. However, they do share a school district. The name change was a smart marketing move. There are a number of historic properties in each village, including Philipsburg Manor (Sleepy Hollow), Kykuit (Tarrytown/Pocantico Hills), Lyndhurst (Tarrytown), Sunnyside (Washington Irving’s home, also in Tarrytown), the Old Dutch Church (Sleepy Hollow) and the Old Dutch Burying Ground (Sleepy Hollow). The Union Church at Pocantico Hills with its amazing stained glass windows comissioned by the Rockefellers is nearby. And the Headless Horseman’s ride was reputed to be close by the cemetary. Both villages began to market themselves in a small way, and Historic Hudson Valley, a nonprofit which owns and manages many of the historic properties, began to advertise a bit and get the word out. Tourist traffic had been building slowly, and the local restaurants were pleased to see an increase last year–until Superstorm Sandy hit town. Historic Hudson Valley also souped up the events at its properties and created new ones, like the Great Jack o’Lantern Blaze at Van Cortlandt Manor. 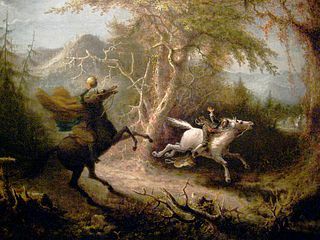 But what really stuck a match to the firecracker was the new TV show, “Sleepy Hollow.” Granted, it bears basically no resemblance to Washington Irving’s characters or to the real villages. One of my neighbors was joking that the two villages between them don’t have enough police cars to fill up one scene in the show. As a result of the publicity, however, we have tour buses, walking tours with guides on Main Street in Tarrytown, and foreign tourists showing up on the River Walk by the Hudson. It’s kind of fun but a little weird when you’re used to living in a (really) sleepy albeit beautiful village like Tarrytown, named one of the 10 most beautiful in the country by Forbes last year. I’ve always enjoyed the feeling that it was our own special secret, living in such a historic, lovely and low-key place. The big event of the Halloween season used to be the Ragamuffin Parade, when the little kids would wear their costumes and walk from Patriots Park to the Y (early years) or more recently the fire station on Main Street and see the fire trucks. I’m told that years ago a person dressed as the Headless Horseman used to ride through the neighborhoods on Halloween and scare people. Now the Headless Horseman figures in our Halloween Parade and appears at events. The locals curse the traffic, but we’re all glad to see more revenue coming to town. And with any luck, once Halloween passes and the autumn leaves have fallen, we’ll go back to being a couple of quiet, charming villages once again.